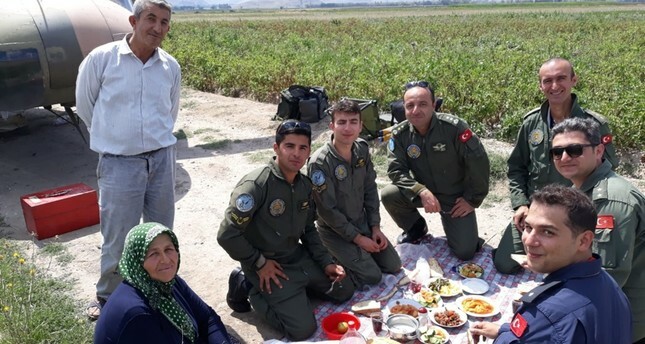 The crew of a military helicopter, which had to make an emergency landing in the western Turkish city of Afyonkarahisar received a warm welcome on the ground with locals offering them a lunch. A UH-1H Huey military helicopter safely landed in Atlıhisar village of Afyonkarahisar's Şuhut district due to a technical problem on Friday afternoon. The locals, noticing the descending helicopter, welcomed the military personnel, fetching food from their homes to prepare a picnic lunch for the soldiers. Meanwhile, necessary pieces to repair the helicopter were brought from Ankara and the jet later arrived at its initial destination of Isparta Military Aviation School.